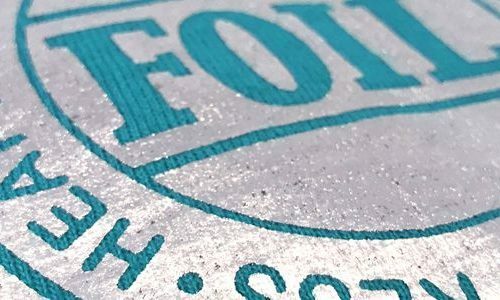 Foil printing is where only one screen is used and prepared the same way as all screens but instead of using ink to print onto the garment, a type of adhesive or glue is pushed through the mesh. Once the adhesive has been applied to the garment, a sheet of thin foil-type is then placed over the top of the glued area and pressed using an industrial heat-press. The foil is then peeled away and all parts that were in contact with the adhesive remain stuck to the garment. At Garment Printing we understand that while you might want to get the best possible products and services, however, it’s not always affordable for you and your business. That’s why we have printing techniques and products which are designed to suit every budget. Further, we are always making sure to exceed our client’s expectations by using only state-of-the-art machinery. This is a great idea if you want something that stands out from the rest and, as a result, this printing technique is ideal for promotional use. This technique works best on standard 100% cotton products, for example T-Shirts, sweatshirts, hoodies, polos and many more products. It is also a great option for tote bags and similar items that are great for promotional use. Check out our diverse Promotional Merchandise offer! Use a wash by hand method ONLY, with cold water and a mild detergent.